Yes, I ordered a Raspberry Pi from Farnell a day or two after launch and it's now finally expected in the fist week of June. Actually, it's worth taking a look in the RPi forums just to see the absolute frenzy of discussion, speculation and other activity for a device which very few people actually have in their hands. This is truly a phenomenon. Anyway, the RPi uses an ARM processor for which a few (three, I think) Linux distros have been made available. There are Debian, Fedora and Arch. Although I've used all three in my time, I'll probably use Arch on my RPi when I get it. A major reason for this is the excellent documentation that accompanies this distro. So, first step was to get it working on my Dell E520 Desktop where I have plenty of available disk space to do a lot of playing around. Installing Arch is very straightforward. Just download from here (I d/l'ed core i686), use UNetBootIn to make a LiveUSB, boot to the USB key and install Arch. I selected existing partitions for / and /home and only the base-devel package, nothing else. Additionally, I chose the ReiserFS filesystem for both / and /home. I have no experience with this FS and I wanted to get to know it. It's reputed to be fast and I like speed. Another novelty that I chose was the LXDE desktop manager primarily because it's lightweight. Once I had the bare-bones Arch installed, with Sudo setup, I booted to the TTY1 (well, I had no choice) and from there I installed LXDE using Pacman. Incidentally, Pacman is a wonderfull package manager and it's almost worth while trying out Arch just to experience the fluency, rapidity and ease-of-use of Pacman. Next I had some problems getting Arch to autologin on boot and go straight to the GUI Desktop. In fact, it's very easy once you know what to do. See this post for some detail. After this you can boot to your Desktop and start customizing it. 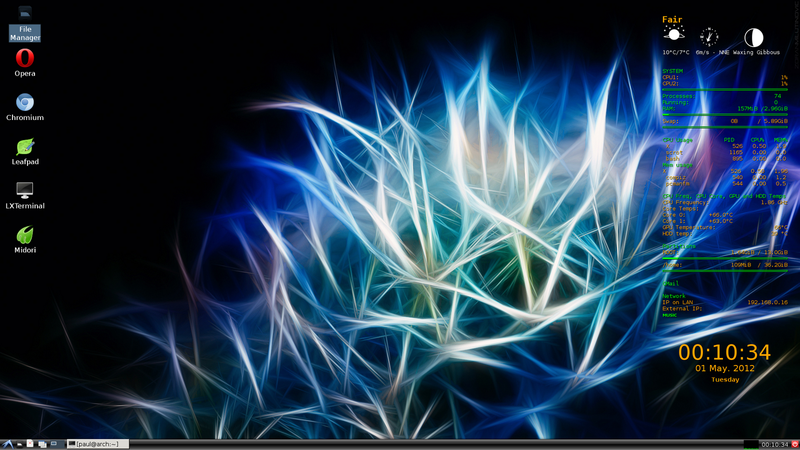 I did some interesting things to get Conky working as well as Compiz and emerald. Now my Desktop looks great although it's still a little unfinished. I'll post some more on this tomorrow.